Yesterday morning I went up to Castle Rock State Park with a plan to do one of my usual loops out and around Goat Rock, this time with the goal of photographing some spring wildflowers. Although April is typically the start of the warm season in the SF Bay Area, it was “anything but” yesterday – at 10:00 a.m. it was only 37 degrees on the ridge and mostly socked in by fog-like clouds. I hadn’t expected quite this weather since it was sunny when I left home, but I put on every stitch of clothing I had and headed on down the trail, passing a good number of cold-looking backpackers who had spent a frigid night at the nearby trail camp. After last week’s rather successful wildflower hikes at Almaden Quicksilver and Calero Parks I was a bit surprised by the small number of flowers at Castle Rock. Perhaps I missed the peak, perhaps it just isn’t going to be a great year for flowers up there, or maybe they just weren’t open since it was so cold. Plants and Rock, Goat Rock. Castle Rock State Park, California. April 19, 2008. 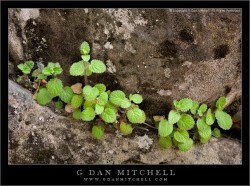 © Copyright G Dan Mitchell – all rights reserved.